What is the warranty on your tanks? The premium weight tanks and black or dark green vertical water storage tanks carry a three year warranty from date of manufacture and the heavy duty tanks carry a five year warranty from date of manufacture. Should a defect appear within the warranty period, Norwesco will supply a new, equivalent tank in replacement thereof. Norwesco's liability is limited to the value of the tank itself and specifically excludes the cost of installation and/or removal or consequential damages. Where can I locate the serial number on my tank to determine when it was manufactured? All Norwesco tanks are embossed with a serial number that is 1/2" in height. You will usually find the serial number by the fill-opening of the tank with the exception of large vertical tanks. Vertical tanks 5000 gallons and larger have the serial number embossed 48"-52" up from the bottom of the tank on the sidewall in line with the gallonage markers. To get a general idea of when your tank was manufactured, click on the following link, Understanding Norwesco serial numbers. If you need a specific manufacture date, please contact your Norwesco distributor. What material is used to make your tanks? Are your tanks FDA approved and is it safe to store water in an above ground tank? Yes, it is safe to store water in the Norwesco above ground tanks and below ground cistern tanks shown on our website. The resin used to manufacture these tanks meets FDA specifications for safe storage of potable water. Click on the following link for specific information regarding the FDA status of the resin. Are your above ground tanks NSF certified? NSF International, founded in 1944 as the National Sanitation Foundation, is known for the development of standards, product testing and certification services in the areas of public health, safety and protection of the environment. Norwesco was the first polyethylene tank producer to receive the NSF61 certification, where applicable, for our potable water tanks. Does the color of a tank have any significance? Generally, colors are used to designate one grade of tank from another and is for production identification only except for Water Only tanks. Our standard color for premium weight tanks is a natural or white and for heavy duty tanks it is light blue. Do not be misled into thinking that a color increases the life expectancy or UV resistance of a tank. How many pounds per gallon will your tank hold? What is the wall thickness of Norwesco tanks? We refer you to the paragraph above that relates to specific gravity/pounds per gallon. Because the wall thickness varies from top to bottom on a tank, it is not the best gauge for determining the quality of a tank. The very bottom of the tank is the thinnest part of the tank and is made that way to flex when the tank is empty or full. Generally the wall becomes thicker as you go from the top to the bottom of a vertical tank. This is done to increase resistance to head pressure created by the height of the liquid in the tank. The radius of the tank is thicker to increase strength where it is most critical. The actual weight of the tank is also not a good comparison when shopping for tanks. Just because a competitor may use more material in the tank does not make it a better tank. That is determined by the resin, mold design and the steps taken during the rotomolding process. What is the maximum temperature that Norwesco tanks will withstand? Polyethylene storage tanks have a maximum storage temperature of 120 degrees F. Contents with a temperature in excess of 120 degrees F-even for a short period of time-can weaken the tank's structural integrity and make it susceptible to deformation and failure. What will happen to my tank if I leave it outside in freezing temperatures? The tank itself does not have a minimum temperature rating. If you plan to keep the liquid in the tank and you know that it will freeze, make sure that you leave room for expansion. The most likely part to crack on the tank is the bulkhead fitting which can be easily replaced. What chemicals can I store in the tanks? Several fertilizers and chemicals can be stored in Norwesco above ground tanks. We strongly recommend that you contact the chemical manufacturer to see if their product is compatible with high density, linear polyethylene. If they cannot answer your question, call our Customer Service department and they will be happy to research it for you. Try to have as much information available as possible such as the temperature of the product, the percentage of product (Ex: Hydrochloric Acid, 50%) etc. Norwesco does not publish a chemical resistance guide due to the infinite range of chemical combinations, concentrations and temperatures. Can I store petroleum products in the tanks? We recommend that you do not store petroleum products in our tanks because they will soften the tank walls. Can I store chemicals or fertilizers in the black or dark green water storage tanks? No, these tanks are designed for water storage only. They are rated at 8 pounds per gallon. Can I use a Norwesco above ground tank for the storage of biodiesel? Please click on the following link for Norwesco's official statement regarding Biodiesel. How many years will my tank last? There is no good way to determine the life span of a polyethylene tank. Many variables can have an effect on the tank - what type of material is being stored in the tank? Is the tank used indoors or outdoors? If the tank is outdoors, what part of the country are you located in? Tanks used outdoors in Arizona or Florida are subjected to more intense sunshine than in Minnesota for example. UV rays will have a detrimental effect on the life span of any poly tank. Is the tank being used strictly for stationary storage or for transport? Each of these factors will have an effect on the life of a polyethylene tank. I have a tank that is several years old. How can I determine if it is still safe for use? If a tank is beginning to show its age, you will be able to see fine fissures or hairline cracks referred to as crazing. Look for crazing on the dome of a vertical tank in the area where sunlight is most intense. The top of a transport tank, which has been allowed to set outside all year, is a good place to look as well. These fine cracks will become more intense and visible as time goes on and will become stress cracks. Giving the tank a good hit with a baseball bat is as good a test as any. The resilience of a good tank will be obvious. A tank beyond its life expectancy will sound dull when struck and could crack as a result. It is better to check early and be safe versus losing valuable chemicals and incurring cleanup expense. When a tank is determined to be unsafe or you know it is getting old, it is best to make it a non-drinking water only tank. How should I plumb my tank? Rigid piping must not be connected directly to a tank. Flexible connections are required between the tank fitting and the pump to allow for expansion and contraction of the tank as it is filled and as liquid is withdrawn. A good quality flexible hose is best. We also recommend proper support under heavy valves and fittings that may be attached to the tank fitting. Please refer to the warning labels on our tanks for details. These plumbing recommendations will also extend the life of the tank by reducing stress on the tank. Norwesco valves and fittings are recommended for all compatible plumbing requirements. How tight can I tighten a bulkhead fitting? When bulkhead fittings are installed at the factory, a torque wrench with a special adapter is used to tighten them. Sometimes the fittings loosen and it may be necessary to tighten them. Without a torque wrench, our recommendation is to hand tighten the nut and then give it another 1/4 to 1/2 turn. Do not over tighten as this may pinch the gasket and cause the fitting to leak. Can Norwesco tanks be pressurized? No, Norwesco tanks cannot be pressurized. Can Norwesco tanks be buried? Tanks specifically designed for above ground use cannot be put underground. If it is put below ground, the weight of the earth around the tank will cause the walls to collapse. Norwesco does make septic and cistern tanks that are designed to be buried. See "Septic and Cistern Tanks" under the Products tab at the top of the page. What type of surface is required for placement of a vertical tank? Inspect the surface to ensure a smooth, level area that will supply full bottom support. A properly constructed concrete pad that is capable of supporting the contents of the tank is the best support and is recommended above 2,000 gallons. Other materials such as very flat blacktop, or contained, packed sand or pea gravel have been used successfully. All surfaces must maintain uniform support through freeze/thaw, erosion and other disturbances. Can I paint my tank? Based on information that customers have given us, to prepare the tank for painting, wipe it down with a paint thinner to remove any oily residue. The paint that seems to adhere the best is an automotive urethane which is commonly used to paint car bumpers. Keep in mind that over time, as a tank expands and contracts, the paint will usually crack and will need to be reapplied. Norwesco accepts no responsibility for any detrimental effect that paint may have on the tank. Do I need to clean my tank before use and if so, how do I clean it? 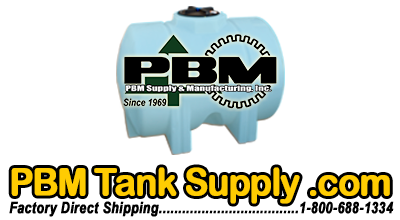 If you are planning on using your tank for potable water storage, you may want to rinse it with a very mild bleach solution to sanitize the tank and then rinse it again with clean water following the bleach solution rinse. Do Norwesco products require a material safety data sheet (MSDS)? No, Norwesco products are exempt from the MSDS requirements established in the Hazard Communication section (29 CFR 1910.1200) of the Occupational Safety and Health Administration (OSHA) regulations. Norwesco products are classified as “articles” as referred to in 1910.1200(b)(6)(v) and as defined in 1910.1200(c). 1910.1200(c) "Definitions""Article" means a manufactured item other than a fluid or particle: (i) which is formed to a specific shape or design during manufacture; (ii) which has end use function(s) dependent in whole or in part upon its shape or design during end use; and (iii) which under normal conditions of use does not release more than very small quantities, e.g., minute or trace amounts of a hazardous chemical (as determined under paragraph (d) of this section), and does not pose a physical hazard or health risk to employees. Do not overtighten tie down straps or bands which may cause excessive stress on the tank. A "snug" fit is best. Do not attach heavy valve and plumbing fittings on a bulkhead fitting without proper support. Always use flexible connections to allow the tank to expand and contract. Always water test the tank before using to be sure fittings are sealed tight. Do not overtighten the bulkhead fitting. Fittings are installed to proper torque ratings at the time of manufacturing but may become loose through movement in shipping. When you get your tank, hand-tighten the fitting and then give it 1/4 of a turn to make sure it's tight. Does the resin used to make your tanks contain the substance Bisphenol A? Please click on the following link for Exxon's statement regarding Bisphenol A. Steel - inductor stands - The 65517 stand – 35 gal and the 63397 stand – 15/30/60 gal are very similar. How can tell them apart? These stands both have a triangle base with mounting holes. The mounting holes on the 65517 are located on the outside of the vertical pipes that are welded to the base and the mounting holes on the 63397 are located on the inside of the vertical pipes. Steel - leg tank bands - When the bands are tightened do they need to tighten all the way to the mounting surface? No – they just need to be tightened until the band is pulled down into the band slot on the tank. Steel - leg tank bands - If the band does not tighten all the way to the mounting surface can a spacer be used to fill the gap? Yes, it is ok to use a spacer as long as the band is able to pull down tight. Steel - applicator saddles - How do I fasten the bands to the saddles? The 30 gal and 55 gal applicator saddles are supplied with nylon bands and are fastened to the saddle with “L” bolts. The 110 gal through 500 gal applicator saddles are also supplied with nylon bands but are fastened to the saddles with “J” bolts. Our saddle assemblies come with bands and all necessary hardware. Steel - applicator saddles - What can be done to prevent the tank from sliding in the saddle? A rubber strip can be inserted between the tank and saddle. The rubber can be as light as inner tube material or as heavy as a floor runner. Steel - elliptical skids - How do I fasten the bands to the skids? The 200 gal through 1000 gal elliptical skids are supplied with steel bands and are fastened to the skid with “L” bolts. Norwesco skids come with bands and all necessary hardware.